Plants have provided most of the natural products used in both modern and traditional folk medicine . Ethnopharmacological research has a crucial role in the development and discovery of new drugs from natural sources. Thus, preservation and clinical investigation of medicinal plant species are strongly required . Anastatica hierochuntica L. (Brassicaceae) commonly known in Jordan region as "Kaff Maryam" or "Rose of Jericho" [3,4], is a small grey plant bearing tiny white flowers with very hard seeds. It is a resurrection plant that grows in arid environments in the Middle East and parts of North Africa [5-7]. A. hierochuntica is usually employed in traditional medicine as a remedy to treat inflammation, arthritis, pain, difficult labour, management of female reproductive disorders, asthma, gastrointestinal disorders, headache, diabetes, and heart diseases [5,7,8]. Phytochemical studies carried out with of A. hierochuntica revealed the presence luteolin, quercetin, apigenin, isovitexin, kaempferol, eriodictyol, anastatin, glucosinolates, glucoiberin, glucocheirolin, terpenes, caffeoyl acids, dicaffeoylquinic acids, dihydroxybenzoic acid, silybins, isosilybins and hierochins [9-11]. Furthermore, several essential oils and phenolic compounds from A. hierochuntica were identified [12,13]. Several studies have demonstrated that A. hierochuntica has pharmacological properties such as antibacterial activity [8,13], hepatoprotective activity [11,14], antioxidant activity [8,10] and hypoglycaemic activity . A. hierochuntica also inhibited the growth of various cancer cells [3,16]. Considering the popular use of this plant in folk medicine and because of the scarcity of pharmacological studies on the antinociceptive and antiinflammatory activities, this study investigated the antinociceptive and antiinflammatory effects of the aqueous extract (AQAH) and chloroform fraction (CHAH) of A. hierochuntica using various experimental models. Furthermore, the possible mechanism that underlies the antinociceptive action of A. hierochuntica extracts was also evaluated. Morphine, naloxone, indomethacin, carrageenan, ethanol, chloroform, dimethyl sulfoxide (DMSO) and 40 % formaldehyde were purchased from Sigma- Aldrich (USA). All other chemicals and drugs used in this study were of analytical grade. Non-fasted male Wistar rats (240-280 g) and Swiss albino mice (24-28 g) housed at 22-25° under a 12 h light/dark cycle and with access to food and water ad labium, were used throughout the experiments. Efforts were made to minimize the number of animals used and their sufferings. The experiments were carried out in accordance with the current ethical and care guidelines for the care of laboratory animals and the investigation of experimental pain in conscious animals . The experiments were approved by the local Research Ethics Committee of the Hashemite University (number-15/03/2014/2015). On the day of testing, mice and rats were removed from the animal care facility to testing area 1 h before testing and placed separately to decrease stress and decrease variability between rats and mice, animals were handled for 5 min before experiments. All test solutions were administered in a volume of 10 ml/kg. Whole parts of wild-growing and dried A. hierochuntica were collected during November 2014 from Ma’an (Jordan; latitude: 30.194958, longitude: 35.734241). The plant material was identified and authenticated at the Faculty of Agriculture, The University of Jordan. A voucher specimen was deposited under the number HU-423 at the Hashemite University herbarium, Zarqa, Jordan, for future reference. AQAH was obtained by boiling 2000 g of the crushed plant (whole parts) of A. hierochuntica. The dried plant (150 g) was boiled in 1000 ml distilled water 10 times, each time for 60 min with continuous stirring. The resultant solution was filtered through a Whatman filter paper. The filtrate was completely evaporated under reduced pressure at 50° to give 50 g of a gummy material. Solutions were prepared by dissolving in physiological salt solution (PSS) as vehicle; pH of the stock solution was 7.4. Powdered plant material of A. hierochuntica (1500 g) was soaked in 2000 ml of petroleum ether (60-80°) for 10 d at room temperature for defatting. The plant material was separated by filtration using cheesecloth. The plant material was extracted with 95 % ethanol repeatedly (2 times, 10 d×2 l each) at room temperature and then filtered through a Whatman filter paper. Ethanol was evaporated under reduced pressure using a rotary evaporator (Heidolph Model Laborota 4000, Germany) and the resulting crude extract residue (70 g) was mixed with water and chloroform (1:1 v/v) using a separating funnel. The chloroform layer was collected and the aqueous layer was discarded. Chloroform was evaporated under reduced pressure to give 25 g of gummy material. Solutions were prepared by dissolving weighed amounts of this material in DMSO and later diluted in PSS. Phytochemical analysis of the AQAH and CHAH was performed basing the standard procedures described by Trease and Evans . The presence of these constituents was confirmed by performing thin-layer chromatography. Mice were used to determine the intraperitoneal LD50 values of AQAH and CHAH. Animals were randomly assigned to different groups containing 6 mice in each group and the first group served as control. AQAH and CHAH were administered intraperitoneally to all test groups in increasing doses from 250 to 3000 mg/kg. The mice were allowed food and water ad labium. Signs of toxicity and mortality within 72 h were recorded. The death of 50 % of mice indicated the LD50 . This test was carried out according to the method reported by Qnais et al. The test was performed using groups of male mice 6 per each group. The temperature of the hot-plate (model 7406, LE, Letica Scientific Instruments, Panlab SL, Spain) was maintained at 50 ± 1°. Latency to a discomfort reaction (paw licking) was determined in seconds, 30 min after i.p. administration of 10 ml/kg PSS (control), AQAH and CHAH (3.16, 10, 31.6, 100, 316 and 1000 mg/kg), or morphine (5 mg/kg, positive control). The largest doses were determined on the basis of LD50 experiments as well as the solubility of the extracts. Smaller doses were calculated to be located at approximately 0.5 log units from each other on a log scale. The cut-off time was 60 s. Prolongation of latency time was compared with the values obtained with control animals. Baseline was considered as the mean of six readings of the reaction time obtained before administration of PSS, AQAH, CHAH or morphine and was defined as the normal reaction time of animals to this temperature. The central antinociceptive effect was calculated using the following formula: % maximal possible effect (MPE) = post-drug–pre-drug/cut off time–pre-drug×100. The method of Janssen et al. was used with a slight modification. The lower 5 cm portion of each tail was immersed in water maintained at 52 ± 0.5°. Nociception was estimated by the latency of flicking the tail at 30 min after i.p. administration of 10 ml/kg PSS (control) or AQAH or CHAH (3.16, 10, 31.6, 100, 316 and 1000 mg/kg), or morphine (5 mg/kg) as positive control. The cut-off time of immersion was 10 s. The central antinociceptive effect was calculated using the following formula: % MPE = post-drug–pre-drug/cut off time–pre-drug×100. The writhing test was carried out as described by Koster et al. . Abdominal writhing was induced by i.p. administration of acetic acid (6 %, 10 ml/kg). Animals (n=6 per group) were pre-treated with the 10 ml/kg PSS (control), AQAH or CHAH (3.16, 10, 31.6, 100, 316 and 1000 mg/kg) or indomethacin (10 mg/kg) as positive control 30 min prior to acetic acid injection. The number of writhings was counted over a period of 20 min immediately after the injection of acetic acid. The % inhibitions of writhing was computed by the formula: % inhibitions of writhing = (N–Nt/N)×100, where N is the average number of writhing of control group; Nt is the average number of writhing of test group. The method of Dubuisson and Dennis  was used with a slight modification to evaluate the antinociceptive activity. Briefly, male rats were divided into groups of rats each and were injected intraperitoneally with PSS (control), AQAH or CHAH (3.16, 10, 31.6, 100, 316 and 1000 mg/ kg), or morphine as the positive control (5 mg/kg). 30 min later each rat received 50 μl of formalin (5 %) subcutaneously into the dorsal surface of the right hind paw using a micro syringe with a 27-gauge needle. Immediately after formalin injection, animals were placed individually in acrylic observation chambers (320×40 cm2). Mirrors were arranged at angles to allow clear observation of the paws of the animals. Duration of licking of the injected paw was defined as the nociceptive response. The total time of the response was measured during the periods of 0-5 min (early phase) and 15-40 min (late phase). The inhibition of licking (%) was calculated using the formula: ((A–B/A)×100), where A is the mean time of licking for the control group; B is the time of licking after treatment. To evaluate the mechanism of action of AQAH and CHAH on pain, animals were pre-treated with the opioid antagonist naloxone (5 mg/kg). Naloxone was administrated intraperitoneally 15 min before administration of PSS, ED50s of AQAH and CHAH, or morphine (5 mg/kg). Using the hot-plate test and the formalin test as described above, latency times and licking were calculated after 30 min of PSS, AQAH and CHAH or morphine administration. Carrageenan-induced rat paw oedema test was performed as described by Alcaraz et al. with minor modifications. Groups of five animals each were used. Paw swelling was elicited with 0.1 ml, 1 % of carrageenan in 0.9 % PSS (w/v) injected in the right hind foot under the plantar aponeurosis. The test groups of the rats were intraperitoneally treated with 10 ml/kg PSS (control), AQAH and CHAH (3.16, 10, 31.6, 100 and 316 mg/kg), or indomethacin as positive control (10 mg/kg) 30 min before carrageenan injection. The inflammation was quantified by measuring the volume displaced by the paw, using a Plethysmometer (Ugo Basile, Model 7140, Italy) at time 0, 1, 2, 3, 4 and 5 h after carrageenan injection. Inflammation (%) was calculated as (final paw volume–initial volume/initial volume)×100. The percent inhibition was calculated as (Vt–V0) control–(Vt–V0) treated/(Vt–V0) control×100, where Vt is oedema volume of treated group, V0 is the oedema volume at 0 time. Statistical analysis was carried out using a statistical analysis program (Igor, version 6.1.2.0 Wave Metrics USA). Results were expressed as mean ± standard error of the mean (SEM). ED50 (the concentration which suppressed the response by 50 %) of the plant extracts were determined from the plot of individual experiments by the best visual fit. One-way analysis of variance (ANOVA) was used to test for significant differences between mean values followed by Duncan’s test for multiple comparisons. A value of (p≤0.05) was considered as statistically significant. The LD50 values of AQAH and CHAH were considered to be more than 3000 mg/kg since no mortality or behavioural changes were observed during the observation period of 72 h. Accordingly, the plant extracts tested could be categorized as highly safe since substances possessing LD50 higher than 50 mg/kg are regarded as nontoxic . Phytochemical analysis of both AQAH and CHAH showed the presence of glycosides, alkaloids, steroids, terpenoids and flavonoids as the most common substances. Proteins were absent in both AQAH and CHAH. 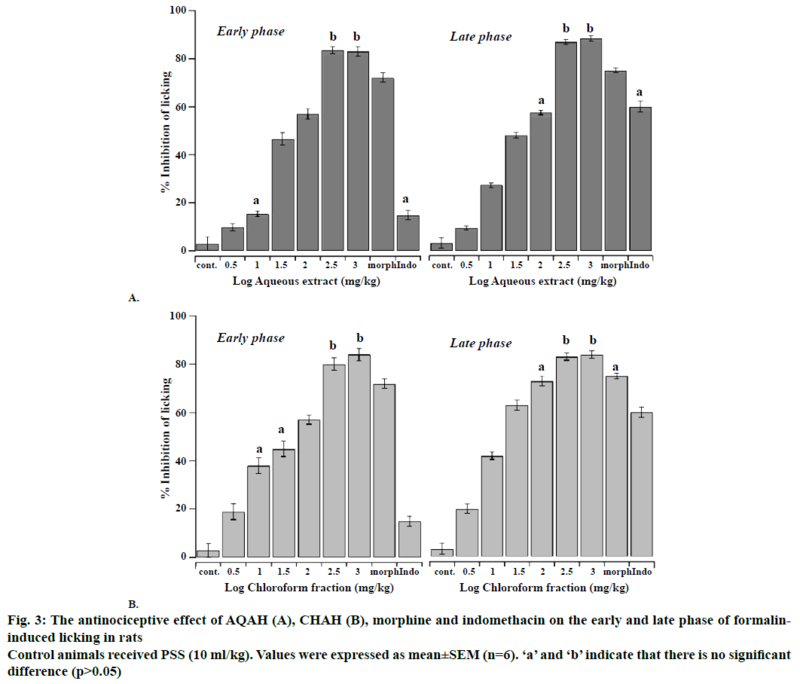 The antinociceptive effects of intraperitoneal administration of AQAH and CHAH (3.16, 10, 31.6, 100, 316 and 1000 mg/kg) on the latency response of mice subjected to hot-plate and tail-immersion tests were shown in Figure 1A and B. The results revealed that there is a significant dosedependent increase (p<0.05) in the latency response to thermal stimulation compared to the control. The median effective dose (ED50) for AQAH and CHAH were 31.0 ± 2.6 and 15.0 ± 1.2 mg/kg, respectively, in the hot-plate test. In the tail-immersion test the ED50s were 26.3 ± 1.7 mg/kg for AQAH and 10.1 ± 1.5 mg/kg for CHAH. The antinociceptive effects of intraperitoneal administration of AQAH and CHAH on acetic acid and formalin nociception have been shown in Figures. 2, 3A and B. The results showed that the AQAH and CHAH at doses of 3.16, 10, 31.6, 100, 316, and 1000 mg/kg, significantly (p<0.05) and in a dose-dependent manner inhibited the number of writhings in the writhing test and the duration of licking in both early (neurogenic, 0-5 min) and late (inflammatory, 15-40 min) phases of the formalin test. In the writhing test, the ED50s were 28.6 ± 1.1 mg/kg for AQAH and 8.7 ± 1.6 mg/kg for CHAH. For the early and late phases of formalin test, the ED50 values for AQAH were 18.2 ± 0.6 and 18.9 ± 0.5 mg/kg, respectively. For CHAH, the ED50 values in the early and late phases were 10.6 ± 0.9 and 11.9 ± 0.3 mg/kg, respectively. Morphine (5 mg/kg) and indomethacin (10 mg/kg) were used as positive controls and the percent inhibitions produced by these positive controls were 72 and 15 % for early phase and 75 and 60 % for late phase, respectively. To elucidate the potential mechanisms involved in the antinociceptive activity of AQAH and CHAH, animals were pre-treated (15 min) with a non-selective opioid receptor antagonist, naloxone (5 mg/kg). Pretreatment of animals with naloxone partially reversed the antinociceptive effect caused by the AQAH and almost completely reversed the antinociception caused by CHAH and morphine during the hot-plate test and formalin-induced pain (Table 1). The inhibitory effects of AQAH and CHAH in the late inflammatory phase of the formalin model led to test these extracts on the rat paw oedema induced by carrageenan. The values of rat hind paw were measured at 0 time and hourly over a period of 5 h after the injection of 0.1 ml of carrageenan in the right hind paw. The oedema induced by carrageenan in different groups of animal treated with AQAH and CHAH at doses 3.16, 10, 31.6, 100 and 316 mg/kg was measured and compared to those of a control group (PPS) and a positive control group (indomethacin, 10 mg/kg). The AQAH (3.16, 10, 31.6, 100 and 316 mg/kg), CHAH (3.16, 10, 31.6, 100 and 316 mg/kg) and indomethacin (10 mg/kg) significantly inhibited in a dose-dependent manner the progressive increase in paw oedema produced by carrageenan injection (p<0.05; Tables 2 and 3). ED50 values were 29.1 ± 1.8 mg/kg for AQAH and 6.5 ± 1.2 mg/kg for CHAH. The inhibition of AQAH at the dose of 316 mg/kg was comparable with indomethacin (10 mg/kg, p<0.05), whereas CHAH at doses of 100 and 316 mg/kg caused significantly higher reduction in paw oedema when compared with indomethacin (10 mg/kg, p<0.05). Results obtained in the present investigation with AQAH and CHAH in the acetic acid-induced abdominal writhing, formalin-induced paw licking, the hot-plate and the tail-immersion tests demonstrated that the plant extracts tested exhibited antinociceptive activity. These experimental models used were selected such that both centrally and peripherally-mediated effects were measurable. The acetic acid-induced abdominal writhing elucidates peripheral effects; hot-plate test and tail-immersion test reveal central activity, while the formalin-induced nociception test investigates both central and peripheral effects. A non-selective opioid receptor antagonist was used in an attempt to provide some insight into the mechanism involved in AQAH and CHAH antinociceptive properties. The intraperitoneal LD50 of the AQAH and CHAH expected to be greater than 3000 mg/kg. This finding probably suggested that the extracts may have a reasonable margin with regard to acute toxicity. These results were consistent with Shah et al. who reported that during acute treatment studies of ethanol extract of A. hierochuntica, no animal died up to 3000 mg/kg dose level and there were no obvious behavioural changes in the treatment group as compared to the control. The dose-dependent antinociceptive activity of A. hierochuntica seen in the hot-plate and tailimmersion tests indicated that AQAH and CHAH possessed centrally-mediated antinociceptive property. These tests measure, throughout thermal stimulus, the complex response to acute non-inflammatory nociceptive stimuli, and considered as good models for the evaluation of centrally acting analgesics . The response observed in this model resulted from the direct activation of nociceptors by heat and depended on supraspinal integration. Opioid drugs such as morphine predominantly have central action and increase the latency time of the animals on both hot-plate and tail-immersion tests, a result that is interpreted as antinociception . The antinociceptive effect of opioid like substances is mediated by a direct decrease on the activity evoked by the C fibres in ascending axons . AQAH and CHAH might have direct or indirect action on opioid receptors on the peripheral terminals of both sensory δ and C fibres as well as the morphinelike substance. This speculation is further buttressed by involvement of opioid system on antinociceptive action of AQAH and CHAH. The writhing test has long been used as a screening tool to evaluate antinociceptive properties of new substances. In the writhing test, acetic acid activated peripheral nociceptors on the sensory nerve fibres by releasing pro-inflammatory substances. The nociceptive response in the acetic acid-induced abdominal constriction assay resulted from the synthesis of prostaglandins by the action of the constitutively expressed enzyme cyclooxygenase-2, which produced hyperalgesia and pain . Nonsteroidal antiinflammatory drugs like aspirin inhibit synthesis of prostaglandin resulting in a decreased sensitivity of the nociceptors to pain producing agents such as bradykinin . AQAH and CHAH caused a significant dose-dependent decrease in the number of acetic acid-induced writhes in comparison to control. This observation indicates that AQAH and CHAH could possess peripherally-mediated antinociceptive property and AQAH and CHAH induced analgesic effect through different mechanisms and at different levels linked to inhibition of prostaglandin synthesis, L-arginine-nitric oxide-cyclic GMP-ATP-sensitive K+ channel cascade, serotonergic pathway, cholinergic pathway, adrenergic pathway, inhibition of cytokine production and others . The formalin test is used to identify mainly centrally acting agents, which inhibit both early and late phase responses almost equally. Injection of formalin induced a biphasic pain response; the first phase (short phase) is thought to result from direct activation of C-fibre afferent nociceptors. After a short period, the acute phase is followed by a continuous prolonged response (phase II), which is due to the combined effects of afferent input and central sensitization in the dorsal horn. Central sensitization of the dorsal horn neurons occurred during inflammatory pain, in this phase histamine, serotonin, prostaglandins, bradykinin and cytokines such as tumor necrosis factor-α (TNF-α), interleukin-1β (IL-1β) and IL-8 played major role [31,32]. Suppression of both phases of nociception as observed with the AQAH and CHAH in this study lent strong credence to the presence of both centrally and peripherally mediated effects. This speculation of dual activity is further buttressed by the significant activity observed in the acetic acid-induced abdominal writhing, tail-immersion test and hot-plate tests. The central analgesic action of A. hierochuntica was confirmed using naloxone, a non-selective antagonist of opioid receptors. Naloxone blocked spinal and supraspinal opioid receptors in the central nervous system and it has a relatively high affinity for some opioid binding sites [33,34]. This observation suggested that AQAH and CHAH possessed an antinociceptive action, which could be mediated by direct or indirect activation of the opioid system. The antinociceptive effect of A. hierochuntica could be promoted by a group of constituents, which were extracted during preparation of AQAH and CHAH, such as flavonoids, alkaloids and others. The aqueous and alcoholic extracts of A. hierochuntica were reported to contain a number of bioactive constituents including apigenin, luteolin, quercetin and kaempferol [10,11], which were found to have antinociceptive effect that appeared to be mediated by opioid system in a manner similar to the effects of morphine-like compounds [29,35,36] or by inhibition the secretion of inflammatory cytokines such as IL-1 β and TNF-α [29,37,38]. The antinociceptive effect of A. hierochuntica could be attributed to the single or synergetic action of these constituents or other components. Carrageenan-induced paw oedema test is widely used for the evaluation systematic antiinflammatory drugs (both steroidal and non-steroidal) and the antiedematous effect of natural products . Carrageenan model is characterized by a biphasic response induced by multiple inflammatory mediators. The first phase (0-2 h after injection) is mainly due to release of proinflammatory agents, including histamine, serotonin and bradykinin, from damaged tissues, which mediated vascular permeability. The second phase of swelling (3-6 h after injection) correlated with release of prostaglandins and cytokines [40,41]. AQAH and CHAH significantly inhibited in a dose-dependent manner the development of the first and second phases of oedema compared with control. This effect started from the first hour and was maintained in both inflammatory phases suggesting that the AQAH and CHAH had a nonselective inhibitory effect on the release, biosynthesis or action of these mediators . Further investigation is necessary to understand the precise mechanism(s) involved in these observed inflammatory effect of AQAH and CHAH. The antiinflammatory effects of AQAH and CHAH could be due to the presence of a group of substances that were extracted during preparation of extracts such as flavonoids and alkaloids. For example, the flavones, luteolin, silybin and apigenin showed a dose-dependent inhibitory activities against carrageenan-induced paw swelling in rats through inhibition of inflammatory enzymes, proinflammatory cytokines and nitric oxide [43-46]. The present findings indicated that the AQAH and CHAH possessed antinociceptive and antiinflammatory activities that could have arisen from both CNS and peripheral actions. The effects of A. hierochuntica on pain and inflammation appear to be consistent with its use in folk medicine. The authors are grateful to the Hashemite University for providing the facilities and the financial support to conduct the study. The authors thank the plant taxonomist, Dr. Mohammad Ismail, Faculty of Agriculture, The University of Jordan for authenticating the plant. The corresponding author is grateful to Dr. Esam Qnais for his guidance. Jaradat NA. Medical plants utilized in Palestinian folk medicine for treatment of diabetes mellitus and cardiac diseases. J Al-Aqsa Unv 2005;9:1-28. Ali B, Baker R, Mohammd T, Hassn H. Anastatica hierochuntica L. Used As an Alternative of Conjugated Estrogen (Premarin) in rabbit females. J Adv Chem 2014;9:1783-6. Daoowd WS. In vitro antifungal activity of extracts of Anastatica hierochuntica. Kufa J Vet Med Sci 2013;4:142-8. Daur I. Chemical properties of the medicinal herb Kaff Maryam (Anastatica hierochuntica L.) and its relation to folk medicine use. Afr J Microbiol Res 2012;6:5048-51. Shaban F, Al-Azzawie HF, Mohammed AS. Effect of alcoholic Anastatica hierochuntica extract on some biochemical and histological parameters alloxan induced diabetic rats. Iraqi J Sci 2011;52:445-55. Shah A, Bhandari M, Al-Harbi N, Al-Ashban R. Kaff-e-Maryam (Anastatica hierochuntica L.): Evaluation of gastro-protective activity and toxicity in different experimental models. Biol Med 2014;6:1-10. Gechev T, Hille J, Woerdenbag H, Benina M, Mehterov N, Toneva V, et al. Natural products from resurrection plants: potential for medical applications. Biotechnol Adv 2014;32:1091-101. Abdulfattah S. Study of immunological effect of Anastatica hierochuntica (Kaff Maryam) plant Methanolic extract on albino male mice. J Biotechnol Res Center 2013;7:1-10. AlGamdi N, Mullen W, Crozier A. Tea prepared from Anastatica hirerochuntica seeds contains a diversity of antioxidant flavonoids, chlorogenic acids and phenolic compounds. Phytochemistry 2011;72:248-54. Yoshikawa M, Xu F, Morikawa T, Ninomiya K, Matsuda H. Anastatins A and B, new skeletal flavonoids with hepatoprotective activities from the desert plant Anastatica hierochuntica. Bioorg Med Chem Lett 2003;13:1045-9. Mohamed AA, Khalil AA, El-Beltagi ES. Antioxidant and antimicrobial properties of kaff maryam (Anastatica hierochuntica) and doum palm (Hyphaene thebaica). Grasas Aceites 2010;61:67-75. Nakashima S, Matsuda H, Oda Y, Nakamura S, Xu F, Yoshikawa M. Melanogenesis inhibitors from the desert plant Anastatica hierochuntica in B16 melanoma cells. Bioorganic Med Chem 2010;18:2337-45. Sobhy EA, Tailang M, Benyounes S, Gauthaman K. Antimalarial and hepatoprotective effects of entire plants of Anastatic hierochuntica. Int J Res Phytochem Pharmacol 2011;1:24-7. Rahmy TR, El-Ridi MR. Action of Anastatica hierochuntica plant extract on islets of langerhans in normal and diabetic rats. Egypt J Biol 2002;4:87-94. Abou-Elella F, Hanafy EA, Gavamukulya Y. Determination of antioxidant and antiinflammatory activities, as well as in vitro cytotoxic activities of extracts of Anastatica hierochuntica (Kaff Maryam) against HeLa cell lines. J Med Plants Res 2016;10:77-87. Trease GE, Evans WC. Pharmacognosy. 10th ed. London: Bailliere Tindall; 1972. Yeo D, Bouagnon R, Djyh BN, Tuo C, N’guessan J. Acute and Subacute Toxic Study of Aqueous Leaf Extract of Combretum molle. Trop J Pharm Res 2012;11:217-23. Qnais E, Raad D, Bseiso Y. Analgesic and antiinflammatory effects of an extract and flavonoids from Artemisia Herba-Alba and their mechanisms of action. Neurophysiol 2014;46:238-46. Janssen PAJ, Niemegeers CJE, Dony JGH. The inhibitaroy effect of fetanyl and other morphine-like analgesics on the warm water induced tail withdrawal reflux in rats. Drug Res 1963;13:502-7. Koster R, Anderson M, De Beer E. Acetic acid for analgesic screening. Fed Proc 1959;18:412-16. Dubuisson D, Dennis SG. The formalin test: a quantitative study of the analgesic effects of morphine, meperidine, and brain stem stimulation in rats and cats. Pain 1978;4:161-74. Alcaraz MJ, Jimenez MJ, Valverde S, Sanz J, Rabanal RM, Villar A. Antiinflammatory compounds from Sideritis javalambrensis n-hexane extract. J Nat Prod 1989;52:1088-91. Soliman GA, Donia Ael R, Awaad AS, Alqasoumi SI, Yusufoglu H. Effect of Emex spinosa, Leptadenia pyrotechnica, Haloxylon salicornicum and Ochradenus baccatus extracts on the reproductive organs of adult male rats. Pharm Biol 2012;50:105-12. Zakaria ZA, Gopalan HK, Zainal H, Mohd Pojan NH, Morsid NA, Aris A, et al. Antinociceptive, antiinflammatory and antipyretic effects of Solanum nigrum chloroform extract in animal models. Yakugaku Zasshi 2006;126:1171-8. Rabelo AS, Oliveira ID, Guimarães AG, Quintans JS, Prata AP, Gelain DP, et al. Antinociceptive, antiinflammatory and antioxidant activities of aqueous extract from Remirea maritima (Cyperaceae). J Ethnopharmacol 2013;145:11-17. Kondo I, Marvizon JC, Song B, Salgado F, Codeluppi S, Hua XY, et al. Inhibition by spinal μ-and δ-opioid agonists of afferent-evoked substance P release. J Neurosci 2005;25:3651-60. Maleki-Dizaji N, Fathiazad F, Garjani A. Antinociceptive properties of extracts and two flavonoids isolated from leaves of Danae racemosa. Arch Pharm Res 2007;30:1536-42. Hamza M, Dionne RA. Mechanisms of non-opioid analgesics beyond cyclooxygenase enzyme inhibition. Cur Mol Pharmacol 2009;2:1-14. Florentino IF, Nascimento MV, Galdino PM, De Brito AF, Da Rocha FF, Tonussi CR, et al. Evaluation of analgesic and antiinflammatory activities of Hydrocotyle umbellata L., Araliaceae (Acariçoba) in mice. An Acad Bras Cienc 2013;85:987-97. Wang Y, Chen P, Tang C, Wang Y, Li Y, Zhang H. Antinociceptive and antiinflammatory activities of extract and two isolated flavonoids of Carthamus tinctorius L. J Ethnopharmacol 2014;151:944-50. Ruangsang P, Tewtrakul S, Reanmongkol W. Evaluation of the analgesic and antiinflammatory activities of Curcuma mangga Val and Zijp rhizomes. J Nat Med 2010;64:36-41. Couto VM, Vilela FC, Dias DF, Dos Santos MH, Soncini R, Nascimento CG, et al. Antinociceptive effect of extract of Emilia sonchifolia in mice. J Ethnopharmacol 2011;134:348-53. Pinheiro MM, Boylan F, Fernandes PD. Antinociceptive effect of the Orbignya speciosa Mart. (Babassu) leaves: evidence for the involvement of apigenin. Life Sci 2012;91:293-300. Hara K, Haranishi Y, Terada T, Takahashi Y, Nakamura M, Sata T. Effects of intrathecal and intracerebroventricular administration of luteolin in a rat neuropathic pain model. Pharmacol Biochem Behav 2014;125:78-84. Bahamonde SMA, Flores ML, Córdoba OL, Taira CA, Gorzalczany S. Antinociceptive and antiinflammatory activities of an aqueous extract of Chiliotrichum diffusum. Rev Bras Farmacogn 2013;23:699-705. Jeon IH, Kim HS, Kang HJ, Lee HS, Jeong SI, Kim SJ, et al. Anti-inflammatory and antipruritic effects of luteolin from Perilla (P. frutescens L.) leaves. Molecules 2014;19:6941-51. Pinheiro BG, Silva AS, Souza GE, Figueiredo JG, Cunha FQ, Lahlou S, et al. Chemical composition, antinociceptive and antiinflammatory effects in rodents of the essential oil of Peperomia serpens (Sw.) Loud. J Ethnopharmacol 2011;138:479-86. Viriato EP, Bianchetti ES, Santos KC, Vaz AF, Campos RMV, Pereira AP, et al. Study of high dilutions of copaiba oil on inflammatory process. Int J High Dilution Res 2009;8:9-14. Boonyarikpunchai W, Sukrong S, Towiwat P. Antinociceptive and antiinflammatory effects of rosmarinic acid isolated from Thunbergia laurifolia Lindl. Pharmacol Biochem Behav 2014;124:67-73. Bhowmick R, Sarwar S, Dewan SMR, Das A, Das B, Uddin MN, et al. In vivo analgesic, antipyretic, and antiinflammatory potential in Swiss Albino mice and in vitro thrombolytic activity of hydroalcoholic extract from Litsea glutinosa leaves. Bio Res 2014;47:1-8. Ueda H, Yamazaki C, Yamazaki M. Luteolin as an anti-inflammatory and anti-allergic constituent of Perilla frutescens. Bio Pharm Bull 2002;25:1197-1202. Funakoshi-Tago M, Nakamura K, Tago K, Mashino T, Kasahara T. Anti-inflammatory activity of structurally related flavonoids, Apigenin, Luteolin and Fisetin. Int Immunopharmacol 2011;11:1150-9. Trappoliere M, Caligiuri A, Schmid M, Bertolani C, Failli P, Vizzutti F, et al. Silybin, a component of sylimarin, exerts anti-inflammatory and anti-fibrogenic effects on human hepatic stellate cells. J Hepatol 2009;50:1102-11. Hougee S, Sanders A, Faber J, Graus YM, van den Berg W, Garssen J, et al. Decreased pro-inflammatory cytokine production by LPS-stimulated PBMC upon in vitro incubation with the flavonoids apigenin, luteolin or chrysin, due to selective elimination of monocytes/macrophages. Biochem Pharm 2005;69:241-8.